Do you want to apply for Lower Division Clerk Vacancy ? Are you searching RSMSSB LDC Recruitment 2018 ? If yes, then here is latest and good news for yours. Rajasthan Subordinate and Ministerial Services Selection Board have recently published employment notification for 11255 Posts. There are 338 Clerk Gr. 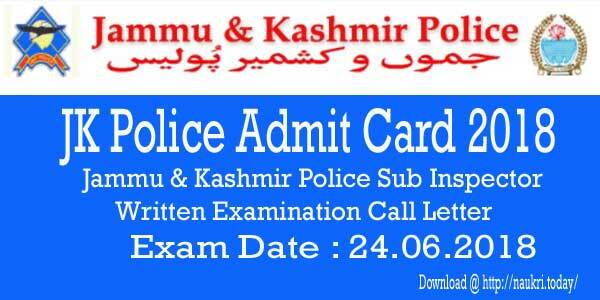 II (लिपिक ग्रेड -II) & 10917 Junior Assistant (कनिष्ठ सहायक) Vacancy. RSMSSB Lower Division Clerk Vacancy 2018 online form available here as well as official site. You can fill RSMSSB Junior Assistant Jobs online form either here of official portal. The last date of filling up online form is 08.06.2018. Rajasthan Subordinate and Ministerial Services Selection Board is inviting online application for 11255 LDC & JA posts. Interested and eligible candidates can fill RSMSSB Junior Assistant Vacancy application form either here or official site. The online registration starts for RSMSSB Junior Assistant Recruitment from 10.05.2018. This is a golden opportunity for candidates who are looking Clerk jobs. Furthermore, information of Rajasthan SMSSB Clerk Recruitment is mention on below section. You can get here eligibility criteria, application fees, selection process and how to apply. 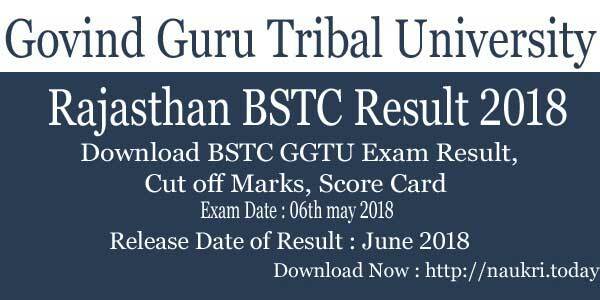 Latest news as on 20th June 2018 : Dear Participants, Rajasthan SMSSB has announced the written examination date of LDC Posts. The written examination will going to held on 12th August, 19th August, 09th September & 16th September. Download RSMSSB Lower Division Clerk Call letter throgh below link. And keep staying on this page for more latest update. Interested candidates who are going to apply for RSMSSB Clerk & JA Recruitment 2018 must ensure that they are eligible or not. Applicants must check given below education qualification, age limit, and other eligibility details. If you are found not eligible your application form not accepted by the department. Applicants who are going to apply for RSMSSB LDC Recruitment 2018 must complete their 12th from recognized board. Applicants also have Computer Degree or Diploma from recognized university or institute. Rest details refer to RSMSSB Clerk & JA Notification 2018. RSMSSB LDC Recruitment 2018 age criteria are made on 01.01.2019. The minimum age is required 18 years while applicants should not be more than 40 years. Other Upper Age relaxation is applicable in RSLDC Clerk Jobs 2018. Applicants selection will be made according to written examination and typing test. There will be organizing two successive phase. In phase I there will be 200 questions of General knowledge, Science, and Maths, General Hindi & English. The duration of RSMSSB LDC Recruitment examination is 06 hours. Then the organization will conduct typing test for qualified candidates. More information checks RSMSSB Clerk & Junior Assistant Exam Syllabus. More information available on RSMSSB Junior Assistant Recruitment Notification. Candidates also need to pay an application fee for RSMSSB Lower Division Clerk Bharti. The application fees should be submitted through online mode. Details of category wise RSMSSB LDC Recruitment 2018 exam fees is mention below. Rest details refer official notification. After qualifying the two phases of selection, candidates will receive a monthly salary. Applicants salary will be made according to Pay Matrix L-5. Furthermore, information checks RSMSSB Lower Division Clerk Vacancy Notification 2018. Applicants who are interested and deserving also for RSMSSB Clerk Vacancy may apply through online mode only. Before going to fill the application form all applicants are advised that they must have valid email id, mobile no. and scan copy of photograph & signature. Please keep all required details in hand of you. Now you can fill RSMSSB Lower Division Clerk Jobs online form. Steps are given on below section. First of all, go to official site www.rsmssb.rajasthan.gov.in. Download notification of RSMSSB Clerk Gr. II/ Junior Assistant Exam 2018. After that read full advertisement carefully. log on to SSO Rajasthan Official portal. If you already registered with SSO Rajasthan then you require to log in only. After that, you go to recruitment section and select department and post. 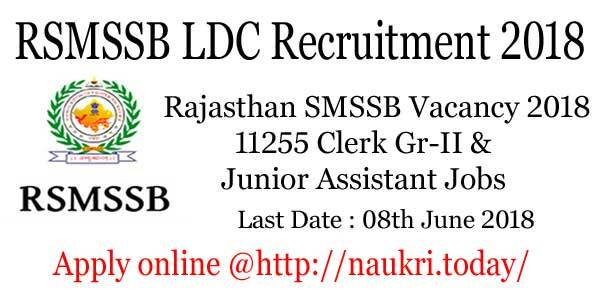 Enter all information carefully on your RSMSSB LDC Recruitment form. Make payment of application fees and then submit carefully your online form. Take print of RSMSSB Junior Assistant Recruitment application form for future uses. You can direct apply online through below links. Conclusion : Rajasthan Subordinate and Ministerial Services Selection Board has recently published an advertisement for 11255 Clerk Gr.II & JA Posts. Interested and eligible candidates can fill RSMSSB LDC Recruitment 2018 online form either here or official site. The last date of online registration for RSMSSB Junior Assistant Vacancy is 08.06.2018. Furthermore information available on above article.